The Steep Canyon Rangers stepped out from their usual routines to help celebrate the 200th Anniversary of “The Star Spangled Banner” and to help bring awareness of the great work of the Blue Ridge Parkway Foundation with a video to celebrate the Graveyard Fields trail and the song it inspired. Hope you enjoy! Save $$ and get early bird discounted tickets by April 30 for the 22nd Annual Graves Mountain Festival of Music taking place May 29-31, 2014. Advance tickets are only $75 for 3-Days. Order now by phone at 540-923-4231, the Graves Mountain website or by sending a check or money order to Graves Mountain, Syria, VA 22743 by April 30. 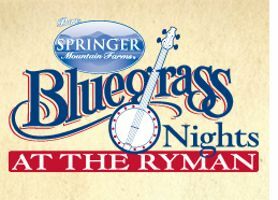 McMinnville, TN -- The fourth season of PBS' Emmy-winning Bluegrass Underground series - the best looking and sounding music on television - will feature some of the biggest names in bluegrass, Americana, roots-rock and the cutting edges of acoustic music. But you don't have to wait for it to come to your TV. Expanded to four days, the marathon video shoot is scheduled for March 7-9, 2014, in the Volcano Room of Cumberland Caverns in McMinnville, Tenn., with tickets going on sale soon at www.bluegrassunderground.com. Nashville, TN -- The Steep Canyon Rangers, a favorite of bluegrass fans, stopped off in Nashville on their way to host the IBMA Awards show this year. Larry Campbell, producer of the Rangers’ new release, Tell the Ones I Love, was accepting his own award, and they helped to celebrate at the Midnight Windup jam held after the Americana Music Associations Honors and Awards Show, hosted by Jim Lauderdale. The new Steep Canyon Rangers album, Tell The Ones I Love, produced by Larry Campbell at the famed Levon Helm Studio in Woodstock NY features 12 original songs, including the title track and current single is available today! Wrapping up a busy summer touring the country with Steve Martin and Edie Brickell, the Steep Canyon Rangers are releasing their newest project today. The new album, Tell The Ones I Love finds the Steep Canyon Rangers in a unique situation, and one they don’t take lightly: “It took a lot of work for us to nose our way into the bluegrass world and become a de facto representative,” Sharp acknowledges, “and we think it’s a real responsibility.” With this new record, “we can be a bridge between the bluegrass crowd and a wider audience that may not be die-hard bluegrass fans.” Yet. Syria, VA -- The Graves Mountain Lodge is proud to announce the performance line-up for the 21st Annual Graves Mountain Festival of Music taking place May 30 – June 1, 2013 in Syria, VA. USA Today listed Graves Mountain in the “10 Great Places to go to bluegrass festivals” last year, so fans will certainly be pleased with the incredible line-up of talent with performances by: Carolina Chocolate Drops, Steep Canyon Rangers, Russell Moore & IIIrd Tyme Out, Lonesome River Band, The Cleverly’s, Junior Sisk & Ramblers Choice, Mark Newton & Steve Thomas, Charlie Sizemore Band, Don Rigsby & Midnight Call, Lorraine Jordan & Carolina Road and many more.